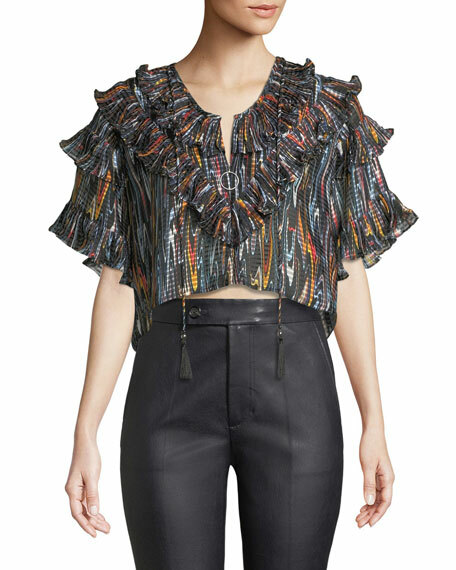 Opening Ceremony ruffled, cropped blouse with beaded tassels. Hidden front zip with O-ring pull tab. Half sleeves with ruffle trim. Founded in 2002, Opening Ceremony represents a team of designers including both veterans and up-and-coming names. The line often features collaborations with acclaimed designers who have their own labels and takes its name from the spirit behind the modern-day Olympics. For in-store inquiries, use sku #2464697. In one of the cool hues of the season, the Tahari Woman Aileen blouse presents an appealing evening topper. Two-tone charmeuse. Deep V neckline. Ruffle front. Hem hits below hip. Polyester/spandex. Dry clean. Imported. 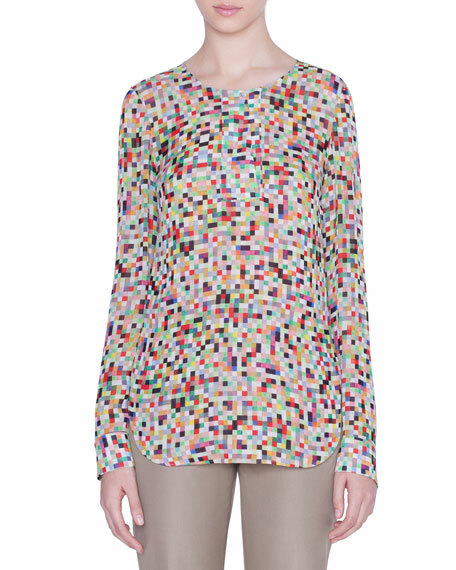 Akris punto blouse in pixel print mulberry silk. V neckline. Long sleeves with ruffle detail at seam. Back box pleat. Relaxed fit. Side-vented hem. Viscose. Imported. Jonathan Simkhai blouse featuring ruffle trim and lace insets. Deep V neckline. Long, sheer sleeves; bell cuffs. Empire waist. Slipover style. Easy fit. Nylon/cotton/rayon. Combo, polyethylene. Imported. 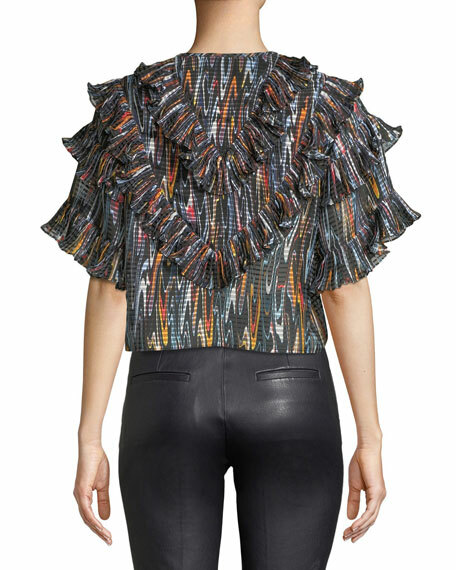 Kobi Halperin "Gwenn" floral-print blouse with embellished neckline and ruffle trim. Ruffle-trimmed collar with self-ties; concealed button front. Bracelet sleeves; ruffle cuffs. Tailored silhouette. Slits at sides. Even hem. Silk. Imported.